The main population of this New World gull breeds along the coast from Atlantic Canada to the Gulf Coast states, Mexico, the West Indies, Central America, and Venezuela, and winters from the Carolinas south to Brazil and Peru. A smaller population breeds in northwestern Mexico—principally the Gulf of California. 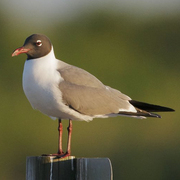 Many post-breeding birds move north to the Salton Sea and the southern California coast, but Laughing Gull is a very rare vagrant farther north along the Pacific Coast. Washington’s four records occurred from mid-July to early September. Three were along or off the outer coast and the fourth was from Wenatchee (Chelan County). Oregon has three records and there are two from British Columbia.